HOINA is dedicated to providing the best medical care possible to our children. Many local and international service organizations have contributed medical services. For example, the local Gundy Rotary Club adopted the HOINA girls’ home and provided preventative medical and dental care on a regular basis. From 1985 – 2000, five children: Lalitha, Aruna, Sharbunisha, Nagaruju and Prakash traveled to the United States for surgery to correct polio deformities. Gayathra underwent five surgeries to repair her face that was severely damaged when acid was poured over her and her mother while sleeping. 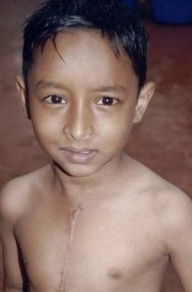 In 2006, Chandrasekhar received open heart surgery. In 2007, Ravi had corrective surgery to repair damage that had left his hand unusable until now. In 2013, Bhagya Lakshmi received artificial ears from a Plastic Surgeon in Hyderabad. Her natural ears had been burned off.